As I have mentioned several times, macarons can be hard to get the hang of. A lot can go wrong while baking them, and not being careful measuring the ingredient is the first step towards failure. Do you have tips on how to use failed macarons? Feel free to leave a comment below. Oh, I just found your blog through a comment you had left on a Martha Stewart recipe post! So glad I did! A blog just for macarons – how wonderful! Well, the reason why I was looking at macaron recipes is that I made a batch yesterday and all the shells had totally cracked. Ugly, but still delicious, as you said. I still went ahead and filled them with a chocolate ganache (rather a lot of crumbles though) and instead of giving them away (they were too ugly), my family had to eat them. :) My recipe had worked perfectly in the past, so I was looking for inspiration as to what might have gone wrong. I’ll definitely check out your site – cannot wait!!! Good to hear you liked my blog! If your macarons crack, it is often because you haven’t folded the batter long enought. Since your recipe has worked well earlier, I guess this could be the case. Hi Christine, I agree with you that you need to measure ingredient quantities very carefully! I have found that adding extra liquid to the mixture (eg colourings, essences) must be done with caution. 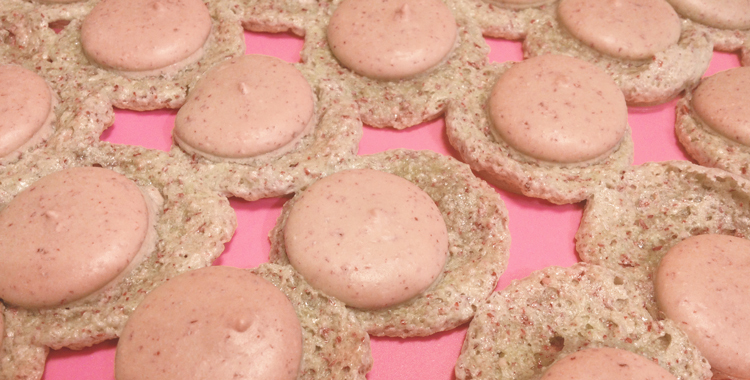 I’m currently looking for a reliable plain macaron recipe to make that produces a decent quantity of biscuits. I saw you comment on the Martha Stewart blog about macarons, where I also saw a comment saying that THAT recipe only makes 12… Do you have any recommendations for recipes that make larger quantities?